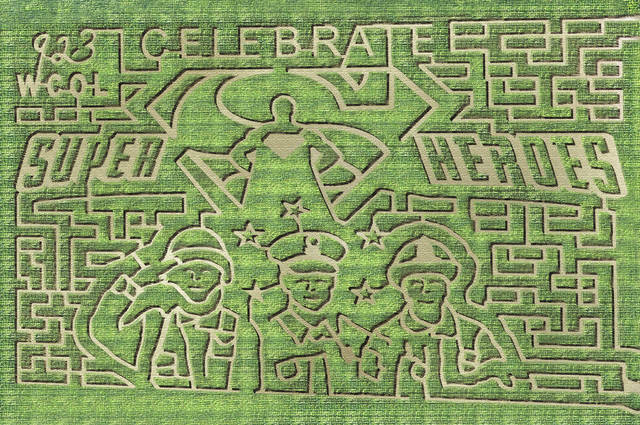 This year’s corn maze theme is “Celebrating Superheroes” at at 8657 Axe Handle Road south of Marysville. MILFORD CENTER – With nine acres of corn planted and their new mind-boggling design now created, the Rausch family is bringing the “MAiZE craze” back to Ohio. The popular labyrinth that drew thousands of visitors last fall will once again get curious maze-goers lost when it opens to the public on Sept 15. Part of an increasingly popular “agritainment” trend, it will be joined this year by nearly 220 affiliated MAiZE sites across the United States, Canada and Europe. The Rausch family, in partnership with maze designer Brett Herbst – the world’s leading designer of 1,500-plus corn mazes — hopes to give even more people a chance to experience the unique source of “good farmin’ fun” in their newly-designed labyrinth. This year’s corn maze is themed “Celebrating Superheroes.” Though the correct pathways can be walked in under 30 minutes, most directionally-challenged visitors – adults and children alike — will require about one hour to travel through more than two miles of twists and turns and 85 decision points. The MAiZE will give visitors the chance to “get lost” Sept. 15 through Oct. 28. Its hours are Fridays from 5-10 p.m., Saturdays from noon to 10 p.m., and Sundays from noon to 6 p.m. Field trip hours, during weekdays, are available by reservation. The MAiZE is located at 8657 Axe Handle Road, just a half-mile off state Route 161 – about 10 miles south of Marysville and 8 miles west of Plain City. The admission price is $9. Discounts are offered for families, groups and field trips. For more information or to make reservations, call 937-349-4781 or visit www.themaize.com or www.mazeandberries.com. Information from The MAiZE at Little Darby Creek.